John Mann, or Jackie as he was known, was born in Barrow upon Soar in 1854. On 12th August 1880 twenty-six year old Jackie married twenty year old Marion Ellen Blount in Barrow. The couple had two children with Edith who was born in 1882 and John Henry born in 1885. Jackie started his working life as a framework knitter making pantaloons, but by the 1901 census he is recorded as a farmer, although still living on North Street in Barrow. The 1911 census finds the family in quite a different position. Jackie and Marion’s son had died in 1904 aged 19, and they had moved to Home Farm at 30 Soar Road, Quorn. There were two farms called ‘Home Farm’ in Quorn; one on Leicester Road belonging to Quorn House and this one on Soar Road belonging to Edward Warner at Quorn Hall. Jackie Mann was recorded on the census as a farmer and employer. Also living with them was their niece Emily Hall aged 21. As with most farms, Jackie would have sold as much produce as he could locally. 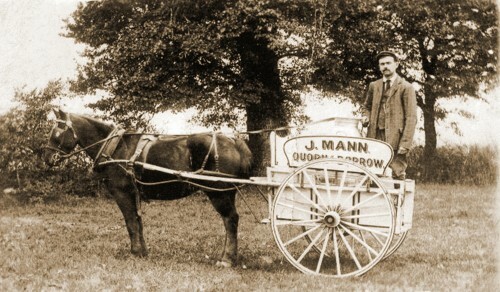 The photograph below shows his milk cart, from which he used to sell the milk produced on the farm. Electoral rolls reveal that the Mann family were still running the farm in 1915, but by 1920, when Jackie was sixty-six, they were living on Station Road. The 1924 electoral roll shows them having moved again, and living in the last house on Mansfield Avenue. Marion died in died 1925, aged 65 and during the 1930s Jackie Mann moved to 84 Barrow Road. Jackie died in 1944 at the grand age of 90 years. As late as the 1990s people still remembered that at Home Farm there was “a meadow in the top left beyond the jitty” which contained in the centre, “a pond called Jackie Mann's Pond". This is thought to be roughly where 22 Victoria Street is today. Missing information: Can you remembers Jackie Mann's pond? Do you know where it was?